Need help to launch or develop your Creative or Digital business? Then The Big House CDI grant could be for you! ‘The Big House’ is the name of the Creative and Digital Industries D2N2 Consortium for increased SME Competitiveness Project. 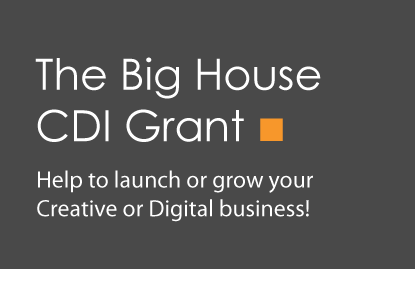 The Big House CDI Grant supports businesses in the Creative and Digital Industries sector in Derbyshire and Nottinghamshire to start and grow. We could say YES to you! Once approved, grant funding can be used to purchase services or equipment to help your business expand or diversify. Grants of between £1000 and £2500 are available. This is for a maximum of 25% of eligible costs. Thus, in order to access the business grant, the minimum project spend is £4000. You will be required to pay the supplier for the full cost of the project before claiming the grant element. It is, therefore, vital that funds are in place to cover these costs prior to submitting the application. No retrospective applications will be considered. Start by completing an expression of interest and submit this to NBV (see right for the link to the form). Basic eligibility checks will be carried out and, if successful at this stage, you will be asked to complete a full application. Full applications consist of an Application Form with supporting evidence in the form of 3 quotes for items required. NBV staff will help you to complete the application and are on hand to answer questions throughout the application process. Once submitted, the application will be considered by the Grant Panel who will meet to discuss all applications and decide which businesses to support according to available funds. N.B. The Big House project is part funded by the European Regional Development Fund (ERDF) and is subject to European Funding regulations.